Will Parker is a children's songwriter and teaching artist, making music for "kids ages 1-100." During Will's whimsical and interactive shows, he plays guitar and harmonica and sings songs that open us up to the world of imagination while simultaneously validating the human experience. A fan favorite at each of Will's show is an improvised song based on topic suggestions from the audience. Additionally, he presents programs on songwriting, the creative process, improvisation, theatre, and story-telling. Will holds both a Master of Arts in Teaching and a Bachelor of Arts in Theatre from Trinity University and teaches theatre at KIPP UPrep High School. Improvised Songs at Every Show! ​"...The themes of tolerance of difference, friendship, and the value of super-saccharine breakfast food is communicated by way of a delightful lo-fi recording style with accompaniment from friends and fans alike. Indeed, Will has crafted these tunes to be "sing-alongable" adding to the inherent fun and ecumenical nature of the songs on "High Five Yourself." 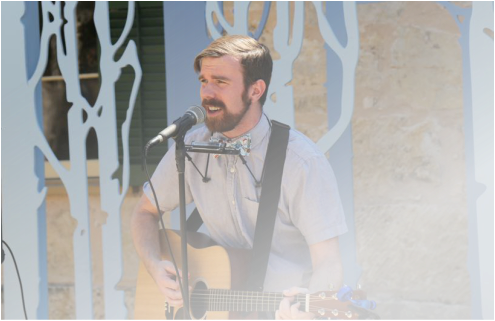 Will Parker and his associated projects (The Somewhat Splendid Individuals and St. Augustine’s Day) represent the best and most interesting of what Texas Indie music has to offer; so like most good things in life, you should experience this music with a friend (or a few)." "The songs are funny and sweet, and might fit right into a They Might Be Giants playlist."